The Monoject™ Softpack Sterile Standard Hypodermic Needle (25 G x 1-1/2" - 0.508 mm x 3.8 cm) – Item #1188825112, Item #NE1188825112 is constructed of the highest quality medical-professional-grade materials. Clinicians can easily open and dispense the contents with the intuitively designed ‘one peel’ package. The increased smoothness of and consistently sharp provides greater comfort to the patient upon insertion in and removal from the skin. 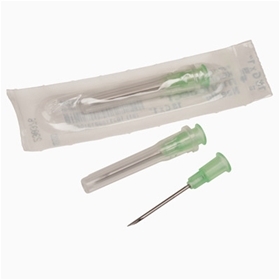 The Monoject™ Softpack Sterile Standard Hypodermic Needle (25 G x 1-1/2" - 0.508 mm x 3.8 cm) – Item #1188825112, Item #NE1188825112 meets virtually all injection requirements, providing a very secure fit and can be manipulated with less chance of breakage and brilliant gauge colors for easy gauge size identification. Ultra-sharp, tri-beveled, anti-coring, stainless steel needle. Color coded gauge stripe and bar code on individual package.